Sixty contributors shared personal mementos and nostalgic items, ranging from dolls and record players to items from the Holocaust era, at the Anthropology Museum at CSUSB. The exhibit titled “Re|Collect,” brought together residents across the Inland Empire, which went on display May 31, according to a news release on the CSUSB website by the Office of Strategic Communication. “There’s that old saying, ‘those who cannot remember the past are condemned to repeat it,’” said Rabbi Hillel Cohn, the contributor of the late 1930s baby shoes & German I.D. cards. The objects on display are those “that accidentally acquired meaning – saved, perhaps, as a reminder of who we were, where we come from, and what we hoped to become,” said Arianna Huhn, assistant professor of anthropology and CSUSB Anthropology Museum director, as referenced in the news release. “Re|Collect weaves these objects and narratives together to highlight the highly personal yet overlapping meanings of ‘things,’ and the self-revelations that can be uncovered through the process of remembering and sharing stories about the past,” said Huhn. 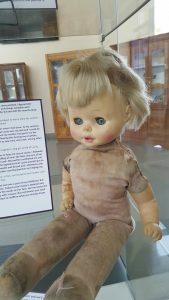 A dilapidated doll with choppy hair took center stage, which came with a heartfelt story from its owner, student Linda de Anda. “Over time, Lucita has come to represent not only a part of my childhood, but also the love that my mother has for me. Today Lucita’s body is tattered and tired,” stated Anda in the display story. “The stitches are as visible as the marks on her face. Her hair gives the appearance of that moment of frenzy with scissors. But sometimes you need an object to hold onto, a physical symbol to reaffirm what you already know,“ continued Anda. Another object, a rusty metal mini locker submitted by Cameron Morrissette of Redlands, shared a story of loss and difficult upbringing, along with losing everything in a wildfire while living in Running Springs. “The locker looking like this feels more of my personality now than what it used to be… The locker it’s an aged art piece. It’s been through a lot. And it’s better now,” stated Morissette in the display story. The last wall of the exhibit featured a community contribution section where attendees may write about an object from their childhood, and can choose to submit a photo to the Museum’s Facebook page. Contributor Lana Gutierrez wrote about an Elmo doll, reflecting on good times with her mom and contributor Michael Saldana shared buying his WWF wrestler collection with his allowance growing up. “The exhibition is envisioned as a chance to bring people together in a way that celebrates the community and refreshes a local pride and sense of community spirit and belonging in the city of San Bernardino and the broader Inland Empire,” said Huhn, according to the CSUSB News article. The recollect exhibit will be displayed through April 2017. To see the Re|Collect Exhibit, visit the Anthropology Museum located in the College of Social and Behavioral Sciences building, on the third floor. The museum is open from 8 a.m. to 4:45 p.m., Monday through Friday, during the academic year, with adjusted summer hours.